Come out and support our amazing music teacher, Mrs. Blue, and her chorus students for their first concert of the year! 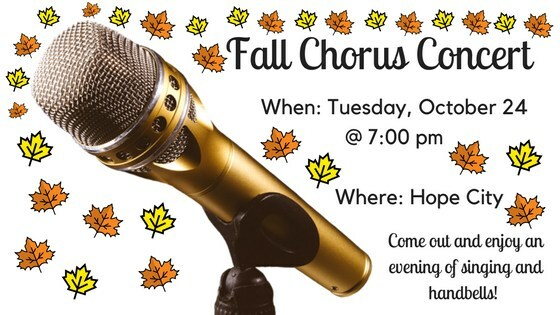 The first chorus concert will take place on Tuesday, October 24th. Chorus students will meet at Hope City at 6:30pm to get ready for the concert. The concert will start at 7:00pm. We will be singing and playing handbells for you and your family! Chorus students need to wear fall colors (i.e. red, orange, brown, etc.). Please email or call Mrs. Blue with any questions you might have (nicoleblue@davidson.k12.nc.us). Thank you! We hope to see you on the 24th!